The USD/JPY hit new 2018 highs as Fed raised rates and US data was satisfactory. A buildup to the Non-Farm Payrolls kicks of Q4. The technical charts show the pair is entering overbought territories. The Federal Reserve raised rates as expected and signaled another move in December as well as three increases in 2019. This was unchanged. The removal of the wording “accommodative policy” weighed on the US Dollar initially. The notion was that the Fed will now slow down the pace of rate hikes. However, Fed Chair Jerome Powell clarified that financial conditions are still accommodative and that nothing has changed in the central bank’s policy. He was very upbeat about the economy. The US Dollar recovered. President Trump was “not thrilled” with the hike, but markets ignored his words. US GDP was confirmed at 4.2% for Q2, and Durable Goods Orders were mixed with a substantial jump in the headline number, but a disappointing core read. Other figures were OK. The Trump Administration accuses China of meddling in the US elections and plans a broadside against the world’s second-largest economy. The trade tariffs came into effect but did not cause any new jitters. Talks between the US and North Korea resumed towards a second Trump-Kim Summit. This development did not help the safe-haven Japanese Yen. The first week of Q4 begins with a full buildup to the Non-Farm Payrolls. The ISM Manufacturing PMI kicks off the week on Monday. It is projected to slide from the highs of 61.3 seen in August but to continue reflecting very robust growth rates. The Price Paid component, which is a gauge of inflation, is also forecast to hold its high ground above 70 points. The ADP private sector jobs report returns to its regular day: Wednesday. The indicators disappointed in August with only 163K, below the averages. A higher gain is on the cards now. The ISM Non-Manufacturing PMI is due on Wednesday and similar to the manufacturing sector, also manufacturing enjoyed an uptick in August with a rise to 58.5 points. The Employment component provides insights into the Labour market. Fed Chair Jerome Powell will speak later on Wednesday and may move markets. It is important to note that this will be his third public appearance in less than a week, so his words may not have a significant impact. Thursday is a lighter day with only Factory Orders, leaving the scene to Friday’s Non-Farm Payrolls. August’s jobs report was upbeat with 201K jobs gained and more importantly, a substantial increase in wages. Salaries rose by 0.4% MoM and 2.9%, an encouraging sign for the Fed. Can the annual pace reach 3%? We will know soon enough. The employment report matters even though a Fed decision is not imminent. The negotiations between North Korea and the US are accelerating. If everything goes smoothly and a meeting between NK’s Kim Jong-un and President Trump is confirmed, it could weigh on the safe-haven Yen. Any surprising setback could boost the currency. Trade concerns are not at the forefront anymore, but they still weigh on the global economy. Also, Trump talked about additional tariffs against China. If the rhetoric continues, markets could react. Otherwise, the topic will stay on the sidelines. 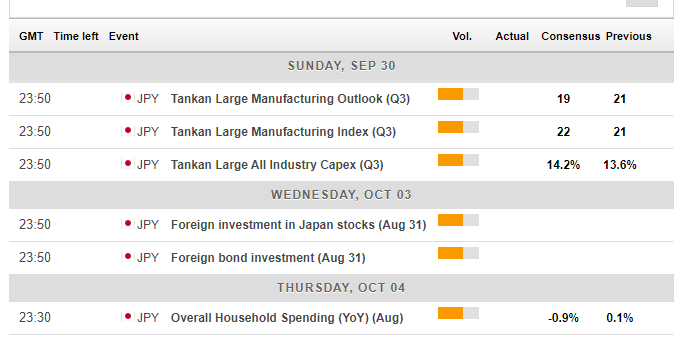 The quarterly Tankan surveys are due early in the week, and they provide forward-looking information on the Japanese economy. 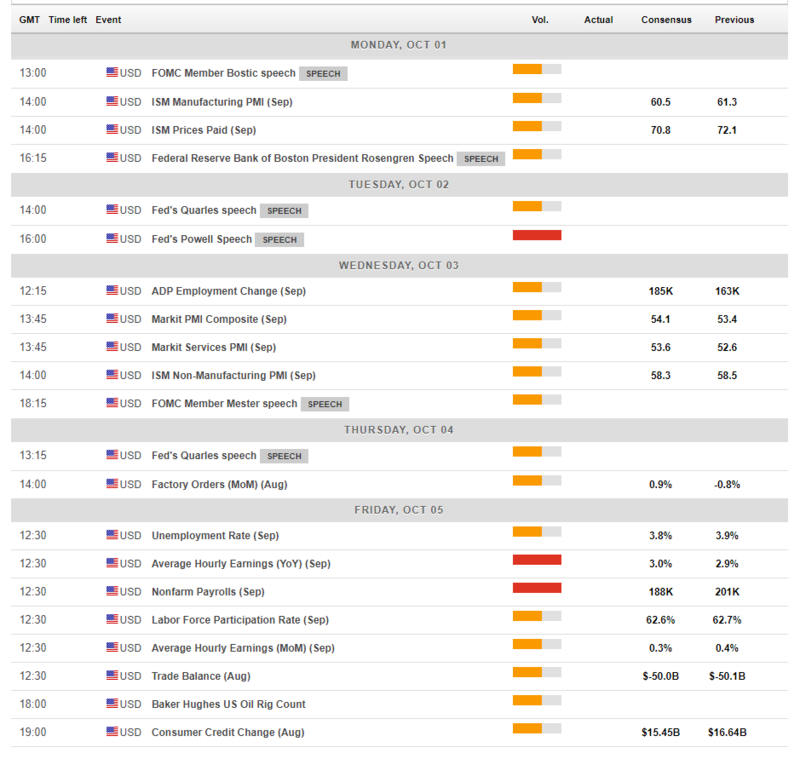 The indicators are at OK levels and are expected to be mixed in the fresh report for Q3. 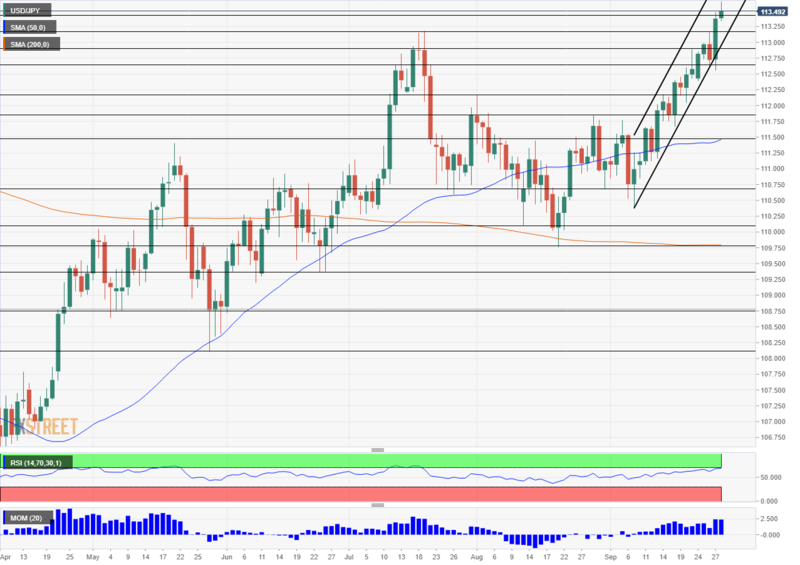 The USD/JPY continues riding the uptrend channel and reached new highs. However, the Relative Strength Index on the daily chart points is already touching 70 which represents overbought conditions. Will the pair correct lower? It trades well above the 50-day and 200-day Simple Moving Averages. 113.45 was the previous 2018 high and the break needs to be confirmed. 113.75 is next up after capping the USD/JPY in December 2017. The next significant resistance line is only at 114.74 which was a peak in November. 115.55 is next. Looking down, 113.15 was the peak in the summer and switches to support. 112.20 capped the pair in August. 111.80 was a high point last month as well and 110.55 follows, defending the round 110 level. Assuming no major disaster, the pair has further room to rise. The Fed is still hawkish and plans to hike rates by 1% until the end of the next year. Robust US data can add support to the greenback.